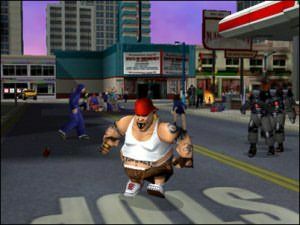 State of Emergency is here with all its downtown attitude and non-stop fighting; thankfully it is not just another cheap attempt at porting to the Xbox. State of Emergency is driven by a weak storyline, that is obviously there as an excuse to let the player get straight into belting people up. The year is 2035 and the Corporation has been working for years to obtain power of global control. This rise in power resulted in the democratic process being abolished and any protest against the rise was liquidated immediately. Now the Freedom group has decided they have had enough and are challenging the authority of the Corporation. A state of emergency has been declared. There are three modes of play throughout the game. These are Chaos, Revolution and Multiplayer. Chaos mode is basically your quick arcade blast where you attempt to score as many points in the time limit allocated. Revolution mode is mission based where the player is rewarded for completing missions by unlocking new characters and places. This mode closely follows the storyline. The multiplayer mode allows for up to four players over split screen. The multiplayer modes that are offered include: Kaos, Last Clone Standing, Deathmatch and Survivor. All these forms of play allow for integration of bots, which is a real benefit. The multi-player part of the game is great fun, and the inclusion of participating AI bots heightens the value of this game as a heavyweight multi-player game. The modes of play are fairly standard but are fun non-the-least due to varied forms of fighting that can occur, from hand to hand to large gun firing scenes. A slight disappointment was the exclusion of system link capabilities, restricting the multiplayer to four players only. A nice touch would also have been to include Xbox Live capabilities, imagine playing inter-country multi-player bash fests. 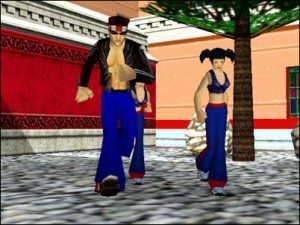 The game-play throughout State of Emergency is very fast paced and full of high-numbered fight scenes. When the player attempts to combat The Corporations officials it is not unusual for a group of them to run in and begin pounding you. Points are rewarded for knocking out gangs and officials that are associated with the Corporation and for destructing any shops or property. The game feels extremely arcade like in many sections, which may deter from the long-term value of this game. Roy McNeil: An angry ex-cop who is against the Corporations brutal form of enforcement. Anna Price: A lawyer is fed up with the Corporation for continually attempting to make her sell out her Freedom clients. Hector Soldado: An ex-gang member who wants to show the Corporation that their treatment of innocents is incorrect. Ricky Trang: An orphan from High School because his parents were arrested by Corporation Security. He wants revenge. Eddy Raymonds: Ex- sport star that refused to be involved in the Corporations match fixing scandals and was jailed as a consequence. Along with these five playable characters come a vast range of enemies and a long list of weaponry that can be used to dispose of them in a stylish fashion. The enemies consist of gangs of mall rats through to the Corporations members and security. 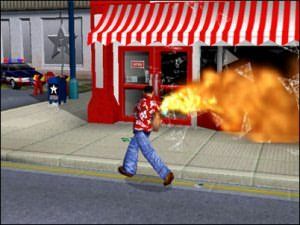 Weaponry that both sides are given to fight with is a range of handheld weapons, pistols, shotguns, rifles, semi-automatics, grenade and rocket launchers and the always-present flamethrower. There are four locations within Capitol City where the game takes place. These are the City Mall, East Side, Chinatown and Corporation Central. These worlds all take quite some time to complete thoroughly yet become rather easy to navigate around after a few minutes. Everything within these locations is destructible from windows to bins to even the hordes of people that flood them. The soundtrack in the game is up to standard, although sometimes the same sounds were repeated often, such as female screams. Character interaction is good, with every character taking on a different personality. The graphics are bright and cartoony which is a refreshing break from the realistic approach of many of today�s games. I found the animation to be smooth, unfortunately however I found my character to occasionally repeat steps on the one spot at the top and bottom of escalators. All round though the graphics and animation are well done, while still continuing the arcade touch of the game. 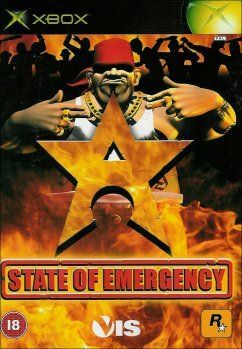 State of Emergency is a good solid game for anyone who is interested in large-scale fights and having a bit of fun with some mates and can handle a bit of arcade style here and there. Those people interested in a motivating epic that you can sit in front of for hours may want to try this one out first before buying it.